It’s hard to imagine that Mystery Science Theater 3000 has been around for 30 years. Sure, there were about 20 of those years when we had no new official MST3K, but that hole in our hearts was filled with worthy successors from the same folks like The Film Crew, RiffTrax and Cinematic Titanic — and DVD releases from Rhino and, later, Shout! Factory. But once show creator Joel Hodgson re-acquired the rights (along with Shout!) to the original, MST3K returned thanks to one of the most successful Kickstarter campaigns to date, and with Mystery Science Theater 3000: The Gauntlet we’ve got the second season of the new version. The first season of the return was outstanding, with a few kinks. Though the new cast was great — especially Baron Vaughn as Tom Servo — you could tell everyone was still finding their footing. The Kickstarter was so successful that the crew were on tap to make 14 episodes in a very short amount of shooting time, and there were a few seams that still showed. (Admittedly, the bulk of the fun of MST3K is the homemade nature of the thing.) The show was made before it was known that Netflix was picking it up, so it was built with spots for commercial breaks. And the quick time spent shooting meant that retakes were a luxury, and thus alternate takes were hastily joined with bubble transitions. While some have complained that Mystery Science Theater 3000: The Gauntlet is only six episodes — and don’t get me wrong, I always want more MST3K — the reduced episode order gave the crew a bit more wiggle room. There are no more bubbles, thankfully, and the cast come off as more comfortable and relaxed in their roles. We’ve also dropped the commercial bumpers. The show doesn’t feel slick per se; after all, it’s MST3K and slickness would ruin it. Instead, it’s more like the difference between season 3 of the original run and seasons 1 and 2. And there are also fewer celebrity cameos — for better or worse. While I enjoyed most of the cameos of the last season, I don’t want MST3K to turn into latter-day Simpsons with famous fans constantly inserting themselves, getting in the way of the characters we know and love. 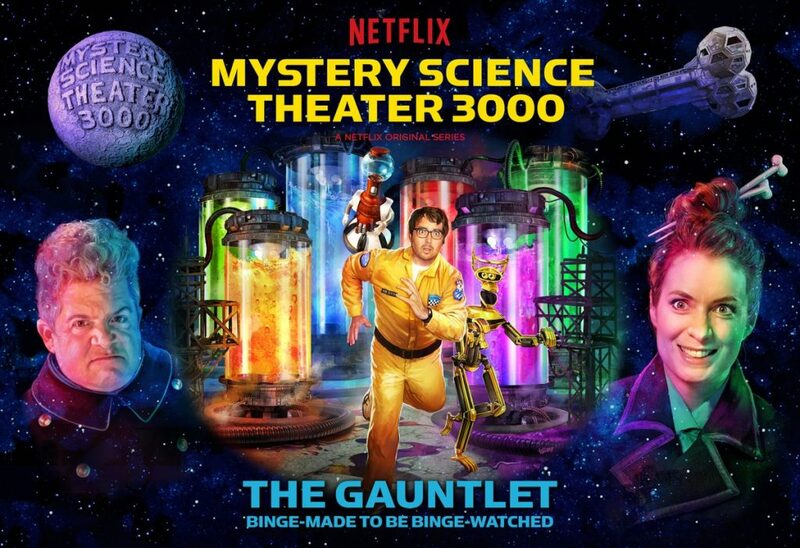 Not all of the changes are good — they dropped the number of mid-movie sketches from three down to two, and there’s still the Netflix-mandated ban on shorts — but overall, Mystery Science Theater 3000: The Gauntlet is definitely worthy of the MST3K name. And the gimmick which gives the new series its name — mainly a gauntlet of six films run back-to-back — is an interesting take on Netflix’s preferred watching method, the binge-watch. Mystery Science Theater 3000: The Gauntlet also lets the show play with continuity. Not a forced continuity like during the first couple Sci-Fi Channel years, but instead giving the show the option to tease future segments, like one featuring a surprising special guest. Aside from Mac and Me, other standout episodes include the Asylum-produced ripoff of Pacific Rim, Atlantic Rim. As shown by RiffTrax, there’s a lot of fun to be had with Asylum’s filmography. Killer Fish, a Lee Majors/Karen Black film, another favorite, is a competently-made joy with its ’70s TV movie vibe (despite being theatrically released). Lords of the Deep, a ripoff of Leviathan, itself an Abyss ripoff, is pretty fun too. I generally think the best MST3K movies are the ones that have some skill behind the camera; The Day Time Ended, from Boggy Creek‘s Charles Band, is too incoherent, and though the riffing is hilarious, I was ready for the film itself to end about 20 minutes before it does. That said, the Music Man-inspired musical number “Concepts” is dead-on. And, the final episode, Ator the Golden Eagle is a swords-and-sandals picture (and the prequel to MST3K favorite Cave Dwellers), which just isn’t a genre that clicks with me — but again, this isn’t due to Jonah and the Bots, who do an admirable job. I honestly find Ator a more watchable episode than Cave Dwellers which loses me a bit. Overall, though, Mystery Science Theater 3000: The Gauntlet improves on The Return in almost every way, and I can’t wait for the next season. (Doubly so if, as hinted in the ending scenes, the next season features filmed versions of the past two MST3K live tours!) The Gauntlet is truly MST3K and I’m so glad to have one of the greatest shows on television back with new episodes. If you were on the fence about The Return, give Mystery Science Theater 3000: The Gauntlet a shot. I think you will find it… pleasing.